Today, when you order "My Personal Deck - Dani DaOrtiz", you'll instantly be emailed a Penguin Magic gift certificate. You can spend it on anything you like at Penguin, just like cash. Just complete your order as normal, and within seconds you'll get an email with your gift certificate. Those who have used it agree that it’s one of the easiest and potent stacks in the world of stacked decks. A work of over 10 years that finally is seeing light in this book. New properties and deep study about the DaOrtiz stack. Adivination, coincidences, exhibitions of skill… all in 134 pages complete with photographs. 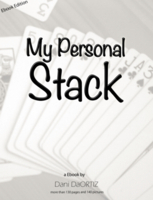 I just finished reading "My Personal Deck" by Dani DaOrtiz. The book read more as an addendum to Tamariz's encyclopedia on the memorized deck in "Mnemonica." This book is for those who prefer hard math to memorization. 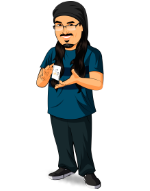 DaOrtiz has created a deck that involves more complicated math that the Si Stebbins deck. It is certainly more deceptive and versatile than most mathematical stacks, but it is a mathematical stack nevertheless. For me, the time put into memorizing all the formulas would be much harder than memorizing a particular random stack, such as the Tamariz stack. The tricks taught are interesting, but not remarkable. And DaOrtiz himself admits that the book is more about learning a new stack than learning new tricks. For that he recommends getting books that teach tricks with stacks and half stacks. So follow DaOrtiz' advice and get Tamariz first. Go on to this one if you still want to explore yet another addition to the world of stacked decks. Buy this it is the BEST stack out there its totally covered and you can also use the Stack to perform tricks like Creation by Cameron Francis which you cant do with mnemonica. You will learn tons of spelling poker and standard tricks and will be able to master the stack in 1 week. The tricks that he desribes aren’t bad but I would suggest buying Joshua Jays At the table lecture for some more stack tricks or bying the Show by Woody Aragon . I would have given the PDF five stars if it was a video, but without someone illustrating it in person, this is quite daunting to understand just reading it. I wish Penguin would make it a little clearer which "instant downloads" are PDFs and which ones are videos. If you are good at reading complex instructions you should not have a problem. But if you need someone explaining it like I do, I would not buy it. 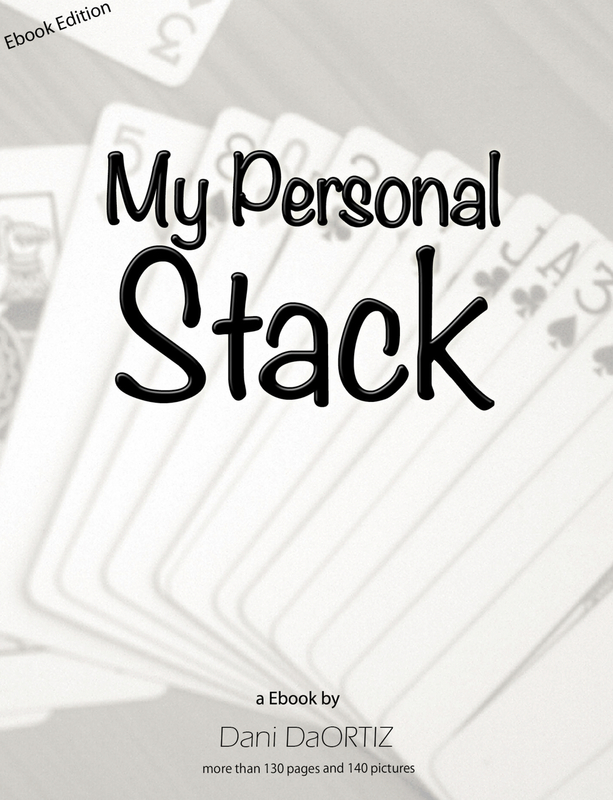 I just bought Dani’s book”My Personal Deck” and I like it so much! I already finished learning the stack and a few anther amazing trick you can do with it! I recommend to everyone to buy even if you are working with anther stack and you are not working with stack at all you are going to find love with it! Great stack. Unlike the Side Stebbins stack, the spectator's can look at the cards being spread and not tell it's a stack. Dani teaches tons of things to do with it. I love this stack method and look forward to a test run with it in a couple of months after I have totally internalized the method and handling..................Thanks Dani, as I know all the hard work you put into this stacking method! This method of stacking is just about impossible to detect. It will take a certain amount of practice and calculation but well worth the effort.Dani shows a couple of methods to get the deck in proper order; one, set up before you start and switching in that deck and, two, a set up you can do with a new deck right in front of the spectators.